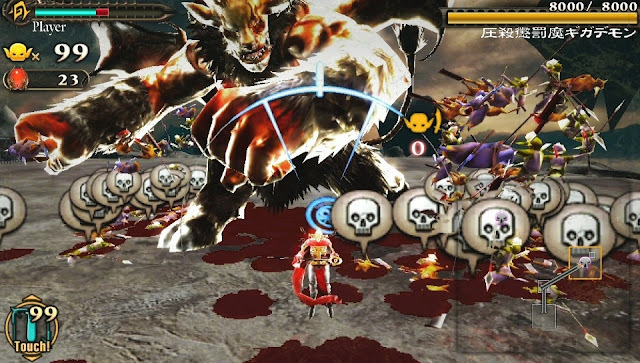 It’s another Vita review here and this time we will be sharing our impressions on Square Enix’s launch title, Army Corps of Hell for the new handheld. Army Corp of Hell is twisted little strategy game, where you take control of the King of Hell to command an army of up to 100 goblins that can be divided into three classes, soldier, magi, or spearman. Each class performs differently, so it is wise to learn each ability in order to kill a variety of enemies and large bosses keeping you from reclaiming your throne. I have spent quite a few hours playing and replaying levels, grinding to see if I can top my best time, earn medals, and items from fallen foes. So now it is time to let you all know about my time spent losing sleep to this game. 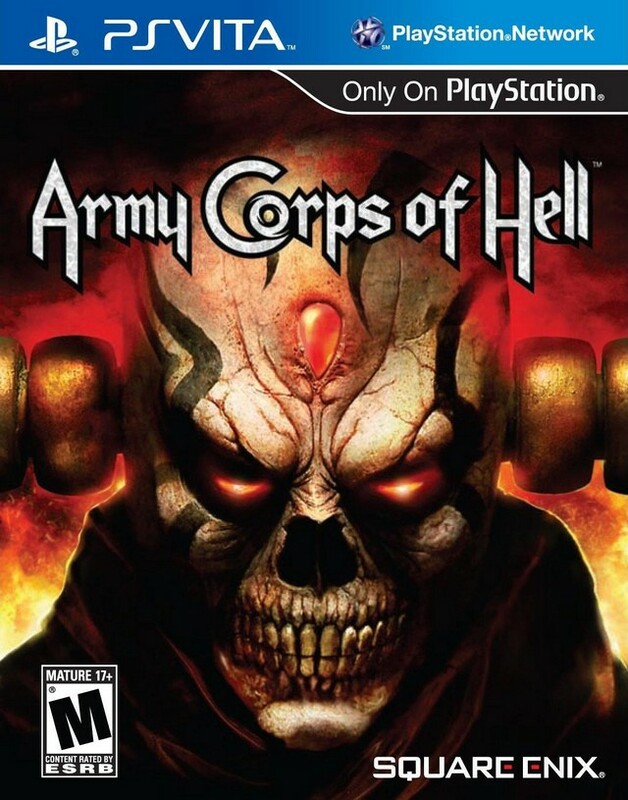 Sounds serious right, nooo, the developers threw in over the top dialogue and a heavy metal soundtrack to the mix. The best way to describe the game would be that it looks and sounds like Brutal Legend, while playing like Pikmin. 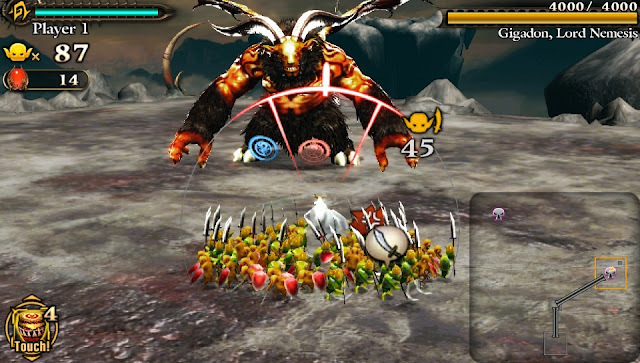 I especially enjoyed the learning curve as it doesn't take long to learn the controls and principles behind the strategy needed to charge through levels and decimate huge bosses. I am not a metal fan, but there are times that hard rock music is just fitting and retaking your throne as the king of Hell just happens to be one of those times. It is easy to go back and replay levels to either get a better medal and/or items to alchemize equipment or life drums. The levels aren't too long but it is easy to play "just one more" to see what else is unlocked with each successful mission, making it far to easy to lose yourself to commanding your goblins in a bloody good time. 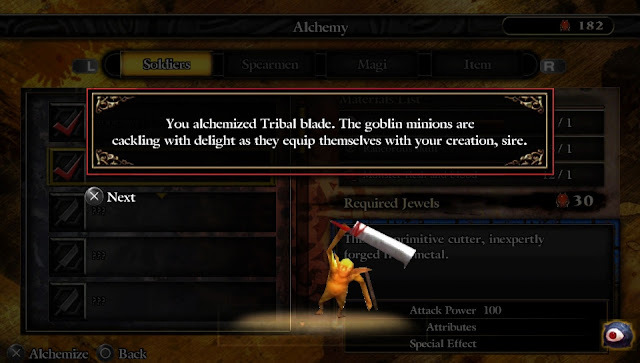 Once you unlock alchemy recipes, curiosity will kick in and you will HAVE play that next level just to see how much easier it now is to wipe out those that stand between you and your throne. Once again, we have another great title for the handheld but also once again, it seems that the biggest thing missing is online multiplayer. Sure this is considered a handheld, but it is also leaps and bounds ahead technology wise in comparison to the 3DS, so much so that I continuously find myself comparing titles to those of consoles and not the previous PSP or Nintendo handhelds. I digress, there are times in which I find myself dying at certain boss fights and am not able to immediately determine which part of my strategy was flawed, but going back and replaying levels isn't too daunting as I think the longest level I have come across has taken me just shy of twenty minutes. 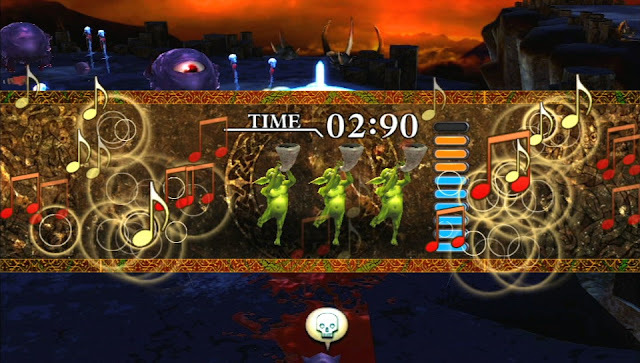 However when you do lose and find yourself without any life drums to revive yourself by banging the backside of the Vita like a bongo to replenish your health, you will be restarting the level from the beginning, but I do suppose it does make sense that hell would not have checkpoints. I had a great time with Army Corps of Hell and will continue to do so to see what I can alchemize and equip next to give me the upper hand against those that stand between me and my evil throne. This game is a strategy title through and through so if that isn't your cup of tea, then you may want to wait until a price drop, you can find a demo, or have a friend in which would be willing to let you try out as I feel this can be a very niche title, but if strategy is more of what you look for in a game then you will not be disappointed and lastly, do not let the heavy metal turn you away, because as a person that is not a fan of the music whatsoever, I did continue to catch myself rocking out to the metal riffs and comedic dialogue, as it fits so well with everything this little portable game has to offer, which is a lot of content, even without the online multiplayer.